Note: An advanced reader copy (ARC) was provided by the authors via Vibrant Promotions. In the past, Will hadn't understood his mother's unwavering devotion to her husband, but he'd finally begun to grasp it. The weeks without David had been excruciating and their relationship had barely begun. What must it be like to be with the same person for ever fifty years? And how impossible would it be to say goodbye? Two of my absolute top reads from last year were Wake and Calm, both belonging to the Tidal series from the writing duo of K. Evan Coles and Brigham Vaughn. While Riley Porter-Wright and Carter Hamilton got their long overdue happily-ever-after, there were a number of secondary characters who had more than caught my attention, and they were more than interesting enough for me to want to learn each of their stories rather than pair them off with one another. Three in particular had me crossing my fingers and toes that Coles and Vaughn had their HEAs planned out for the future: William Martin, Jr., Jesse Murtagh, and Kyle McKee. So, imagine my sheer thrill upon finding out that there was a spin-off in the offing--and the first one to get a shot at a happy ending? Riley's ex--Will! Thirty-three-year-old Will Martin still feels that pang of loss whenever he sees his ex and his ex's boyfriend together, but there was no competing with first love turning out to be the forever kind. Maybe some form of distraction will be good, but he doesn't expect it to come in the form of a phone call from his mother asking him to come home to Long Island because she and his sister need him--his estranged father was dying of pancreatic cancer. Things are bound to get uncomfortably awkward, but temporarily putting the life he loves in Manhattan on hold to do his duty by his mother and sister. He doesn't hold out much hope that he and his father will mend fences, and the last thing that Will is prepared for is to be attracted to his political protege, thirty-four-year-old State Senator David Mori, who just happens to be hot, gay, and Japanese-American...and very much a Republican. Learn more about K. Evan Coles and Brigham Vaughn. 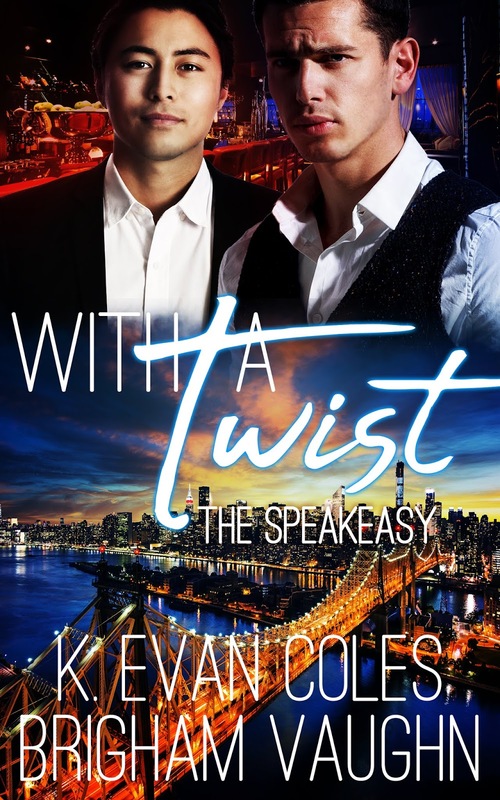 Purchase With a Twist on Pride Publishing | Amazon | B&N | Kobo.